July 26, 2005. I've taken to photographing steel tapes instead of relying on my failing memory for dimensions. 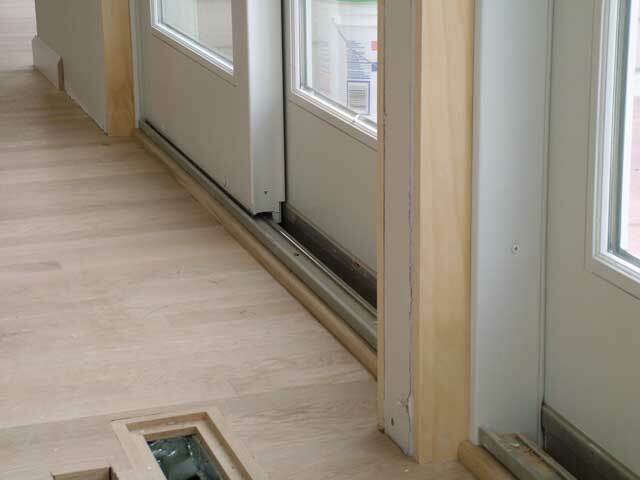 In this case, it's for interior shutters. I end up with a lot of pictures of my feet. July 26. 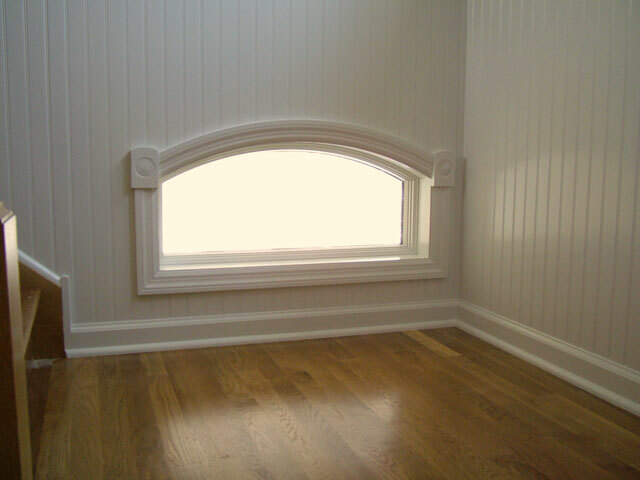 This window above the entry has always been a curious part of the design. It's forced to a low level by one of the mid-level landings. It makes sense from the outside, but seems odd from the inside. Someone remarked that their dog would like it. Since then it's been the "doggie window." July 21. Another shot of the simulated slate porcelain tiles on the top landing. July 21. I've been away from the house for days while the floors get their coats of varnish. 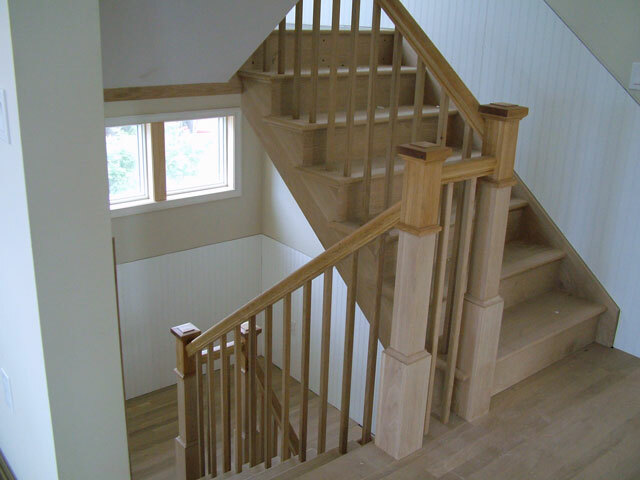 The white oak is quite a contrast to the red oak we have used on the last several houses. The high humidity has lengthened the drying process. It still smells pretty toxic. July 21. Mike has been working on finishing the forced-air floor registers to match the newly-finished floor. 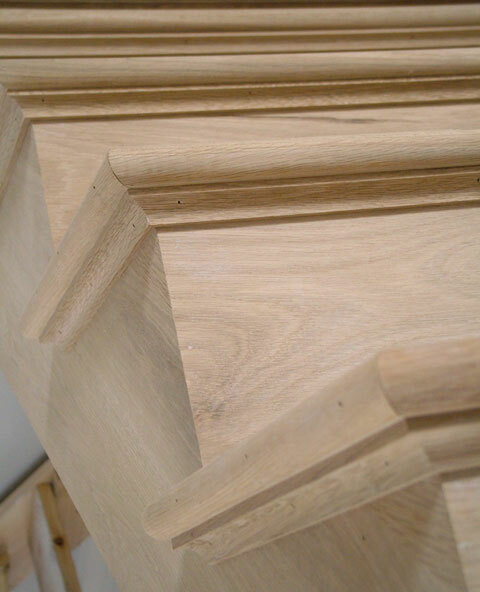 Both are varnished white oak. July 21. 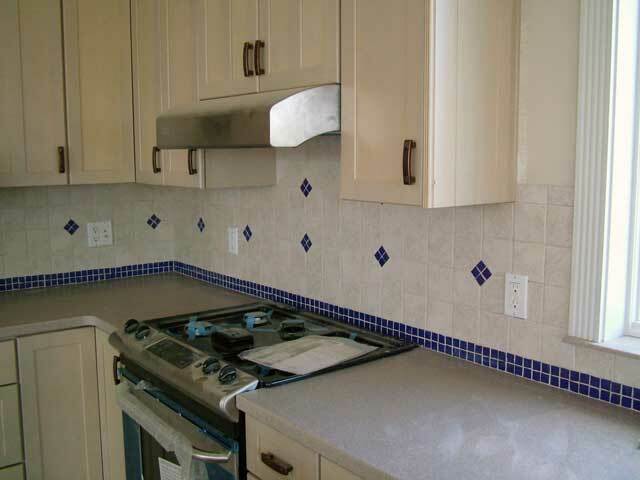 The kitchen backsplash is completed. Rick did a great job. July 7. 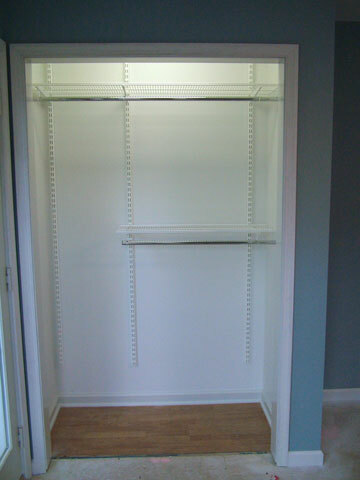 I've been cutting & installing the Elfa system shelving. These will go in all closets, the laundry room and the pantry closet. 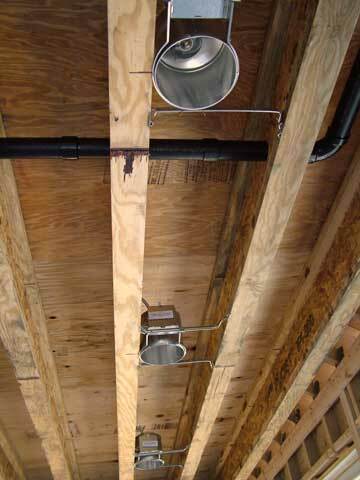 I've used these in previous homes and really like them. July 7. 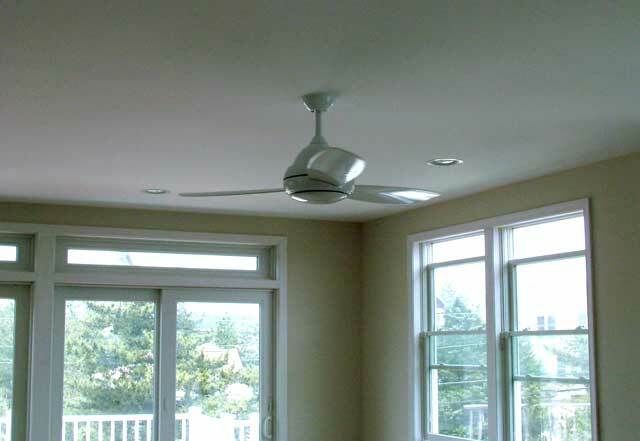 Another shot of one of the Minka Aire Concept ceiling fans. June30. 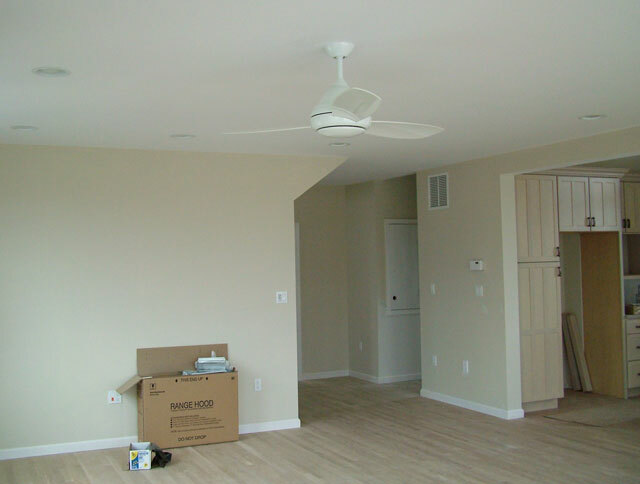 All six ceiling fans are installed & running. Jayne liked the Minka Aire brand which we ordered from Light n Leisure.com. We used both the Concept (shown) and Supra models. June 28. 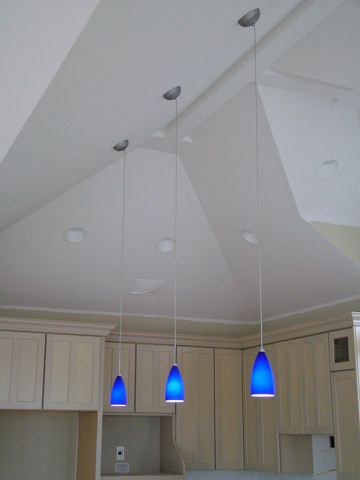 John has hooked up the blue pendants over the kitchen island. With all the adjustments that have been made, I am relieved to find that I got these in the right place. 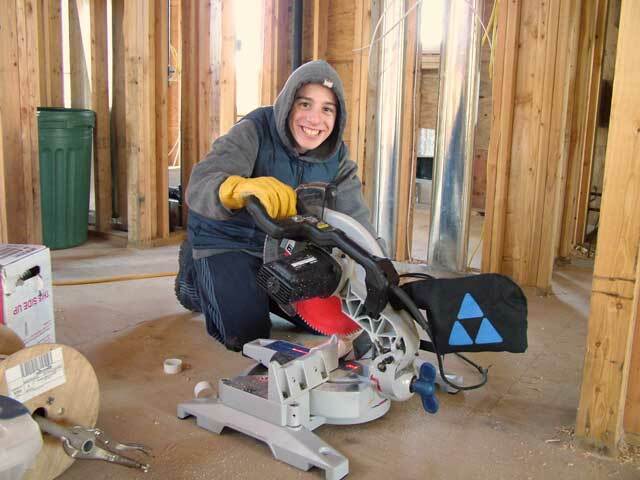 I credit my laser plumb tool, a good investment! June 25. The Corian counters are in. I leveled and reattached the dishwasher to the counter underside. June 21. The plumbers were here today and installed most of the fixtures, including these faucets in the master bath vanity. June 20. 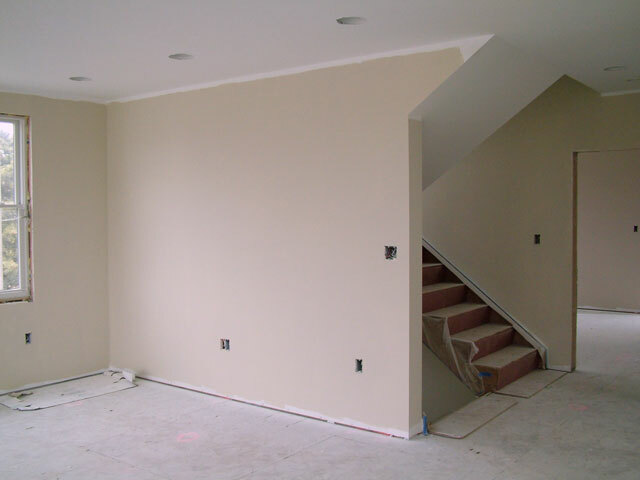 The MDF wainscotting panels are in the stairway. 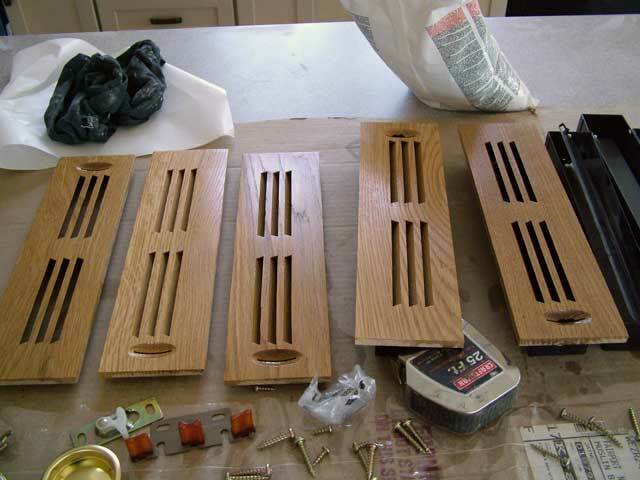 They will be finished with cap trim molding. June 17. 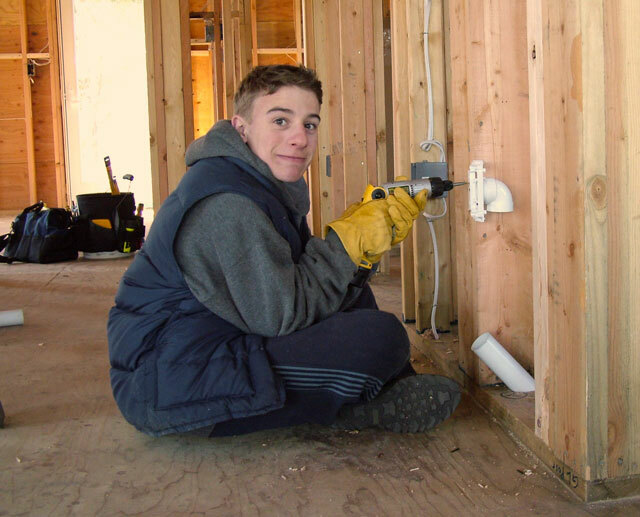 John the electrician is completing the circuits. We actually have lights. Now work can go on all night (ha!). June 16. I salvaged this hardly-used dishwasher from the old house last year. Today I brought it back from our rented storage space. Mike helped me carry it up to the kitchen. June 15. 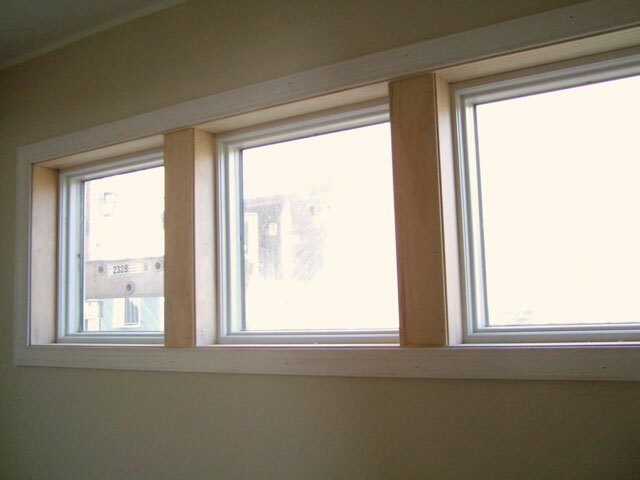 The kitchen window gets its fluted interior trim and is measured (yet again) for its Corian sill. 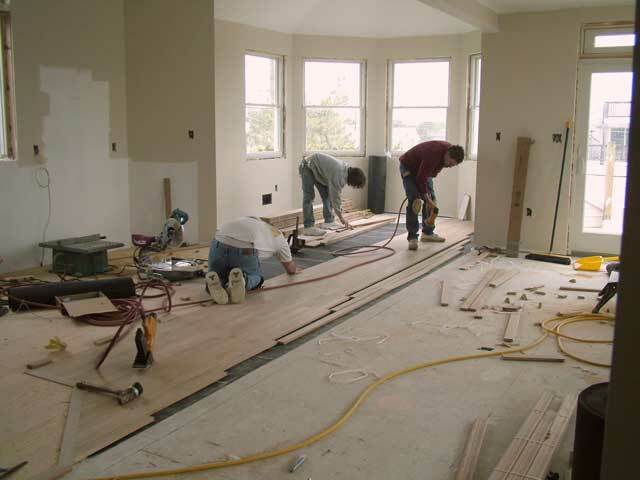 Every house project has something that requires a disproportionate share of attention. This is it. June 15. We used the same simulated slate porcelain tiles on the entry landing. The plan is shown in the upper right insert. June 15. 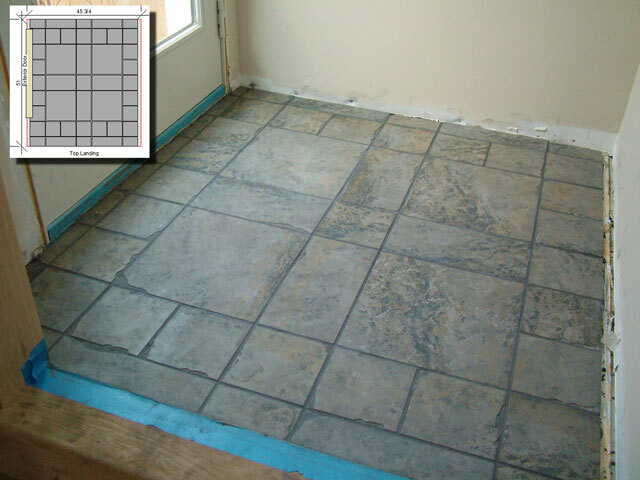 Plan (upper left insert) becomes reality on the top landing tile floor. June 15. The kitchen was ready for the Corian installers to make their templates today. I'll bring the old house dishwasher here tomorrow. June 15. 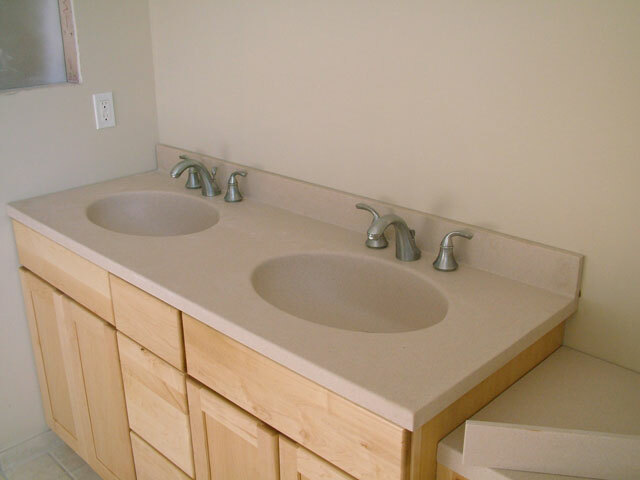 The master bath vanity and Swanstone counter tops are together at last. 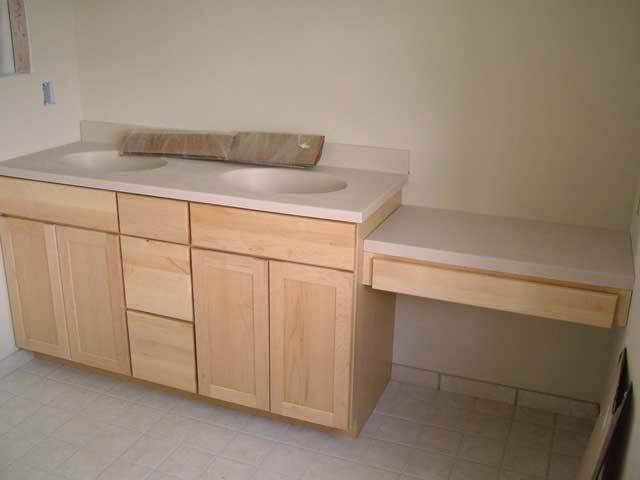 Nice look, but the right-hand top doesn't project over the drawer front. We'll need to fix this somehow. June 11. The master bath medicine cabinet turns out to be some sort of a joke. 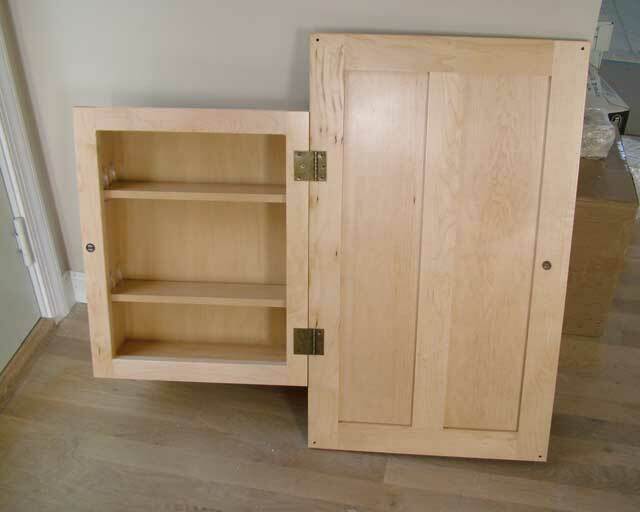 The 18" cabinet comes with a 30" door. June 8. 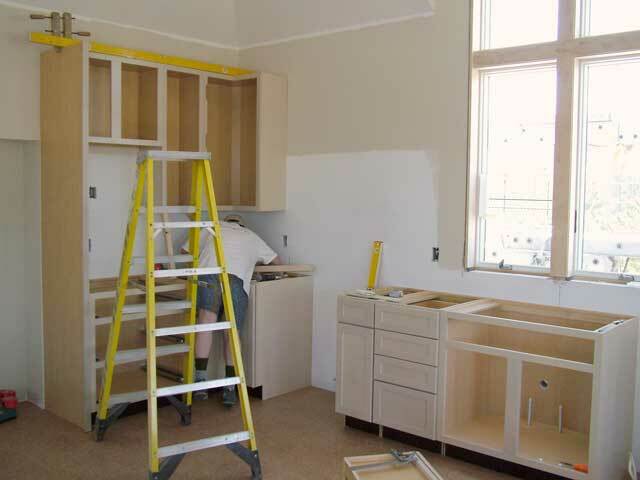 All of the perimeter kitchen cabinets will be installed by the end of the day today. 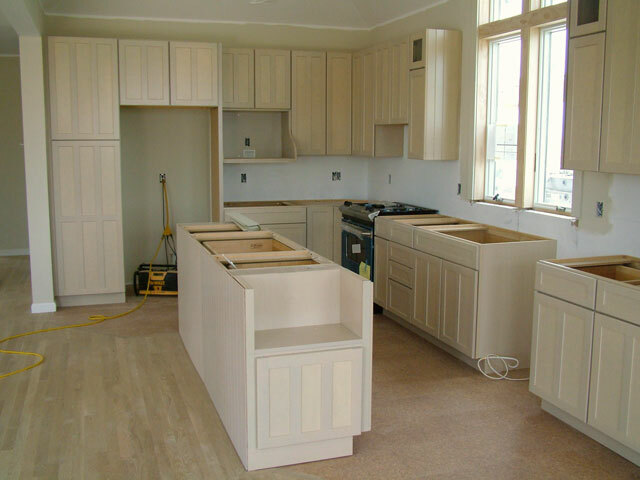 The island cabinets will be done tomorrow. June 8. 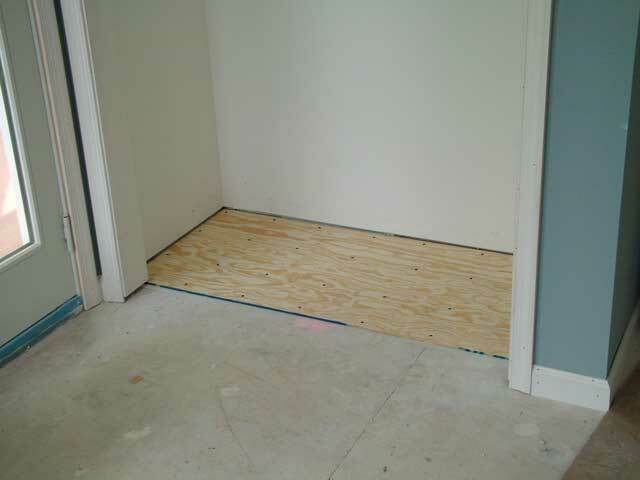 I finished the closet floors today. I did this because the 1st floor bedrooms will get wall-to-wall carpet and Jayne wanted hard flooring in the closets to facilitate cleaning. June 8. DISASTER! 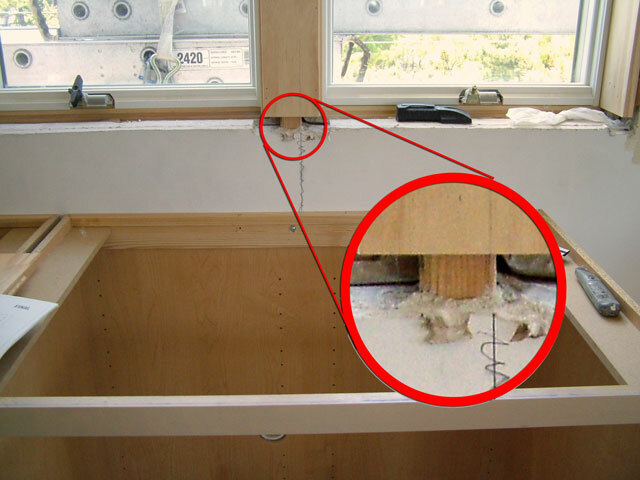 The kitchen sink cabinet misses alignment w/ the window! Relax. I'm just kidding. Actually, we knew the base cabinet would be off by 1/2". The sink itself will be aligned. I promise. June 8. 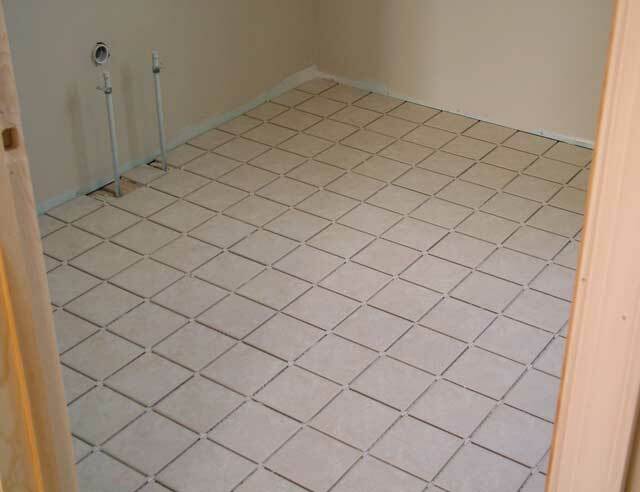 Rick moved from the kitchen to the master bath & powder room floor tiles. 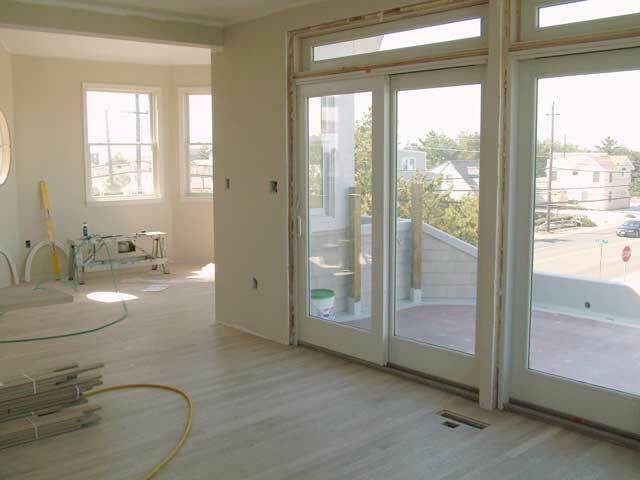 He recommended using a more resilient grade of thin-set due to the normal flexing of these shore houses during storms. June 7. 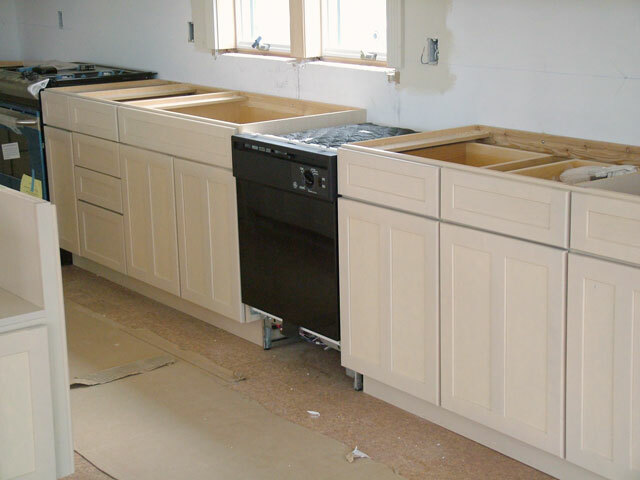 The kitchen cabinets have been uncrated and are ready to be installed, I hope tomorrow. June 7. Here's the slide-in stove. The blue color is just the plastic wrap for shipment. June 7. 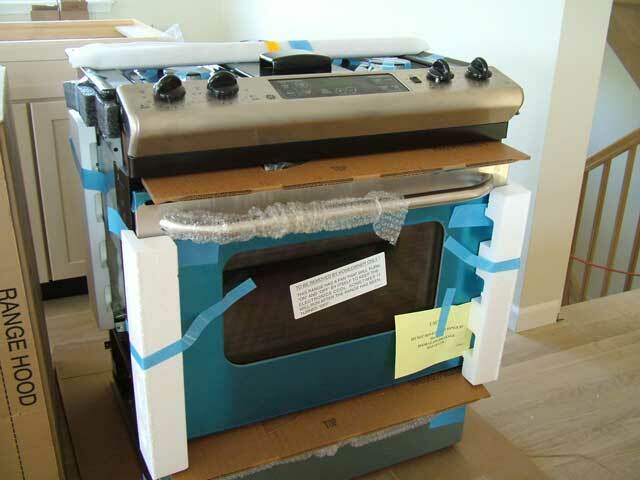 We also received our GE appliance order today. 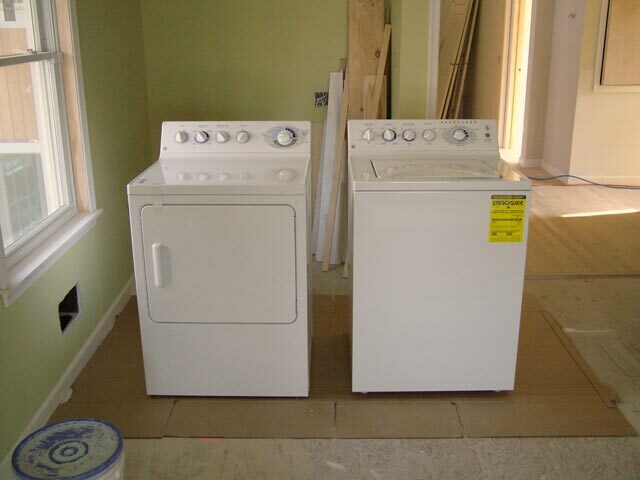 Here's the washer & dryer. June 7. 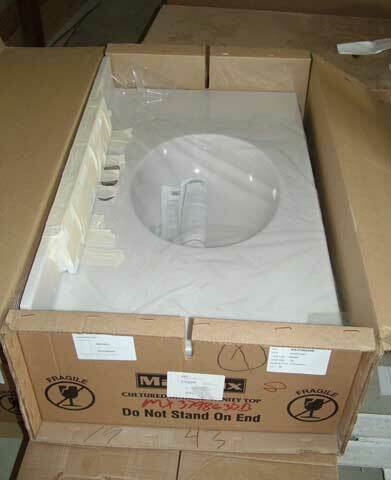 Today I picked up the 3 cultured marble vanity tops ordered via Home Depot. 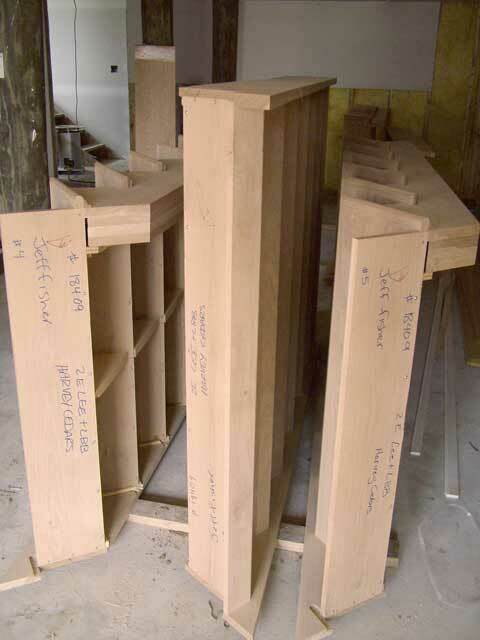 These will go on the first floor baths vanity cabinets and the powder room vanity. June 6. 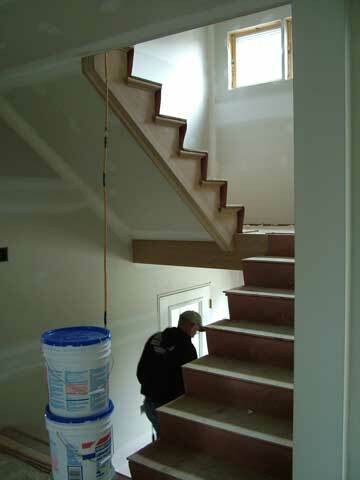 The interior railings are installed and the stairs are uncovered. June 6. 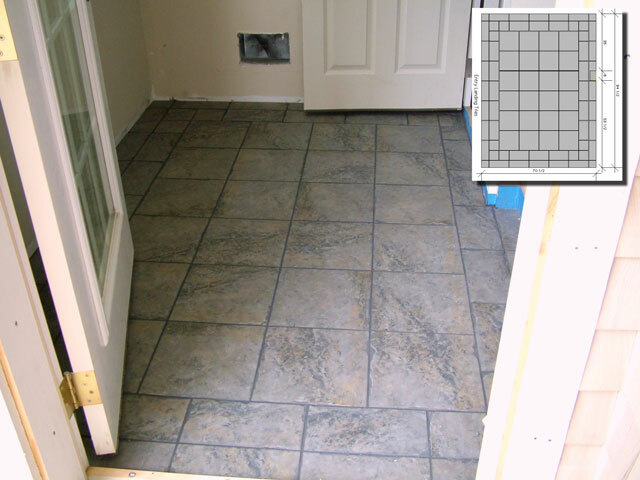 Rick has put down the cork pattern vinyl composite tile (VCT). 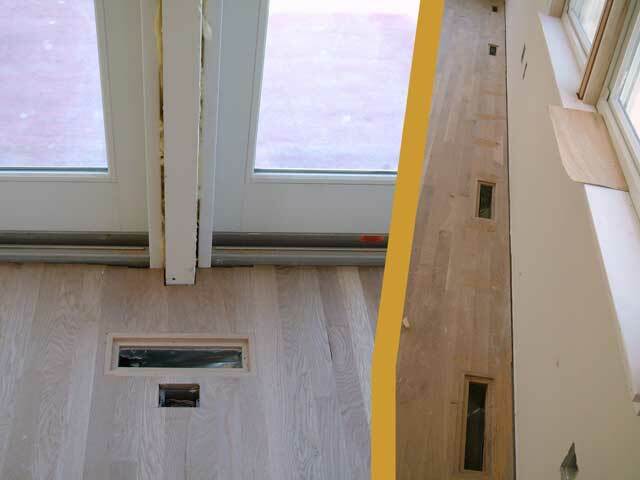 The hardwood and tile meet with a flush joint. June 1. 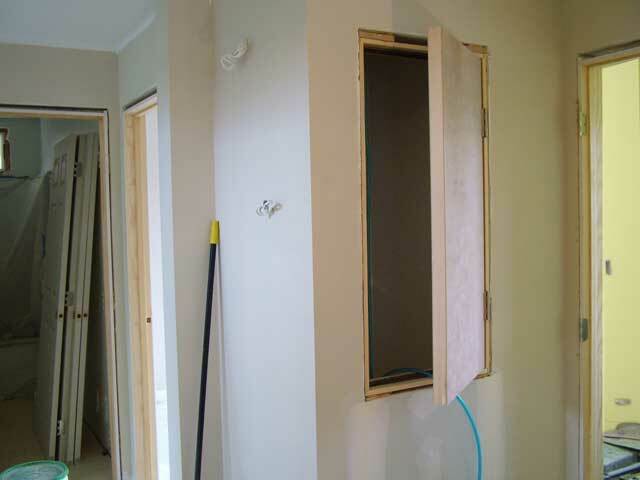 Most of the pressed medium density fiberboard (MDF) interior doors are hung back after lots of adjustments to the jambs. 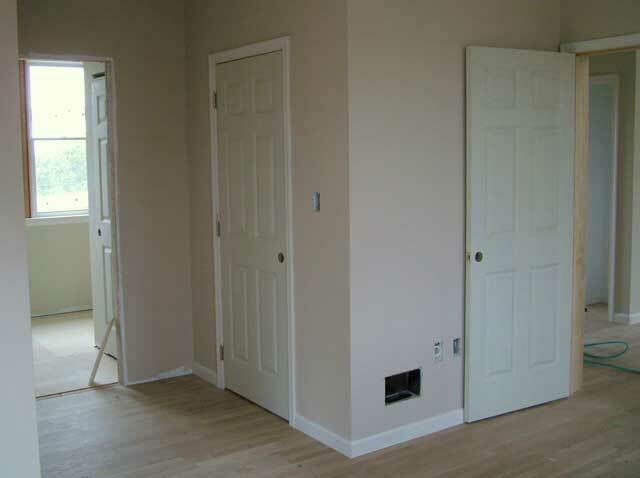 The smooth finish on the doors has been a hit. June 1. 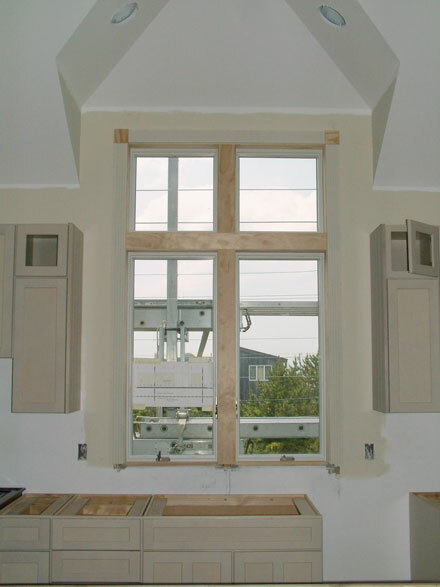 The main kitchen window shows progress. June 1. 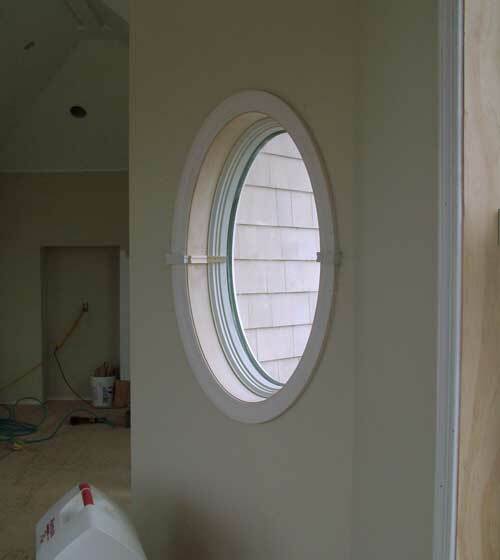 Jeff has also trimmed the oval window in the kitchen. Very tricky. June 1. Jeff has trimmed the bases of the sliding glass doors. June 1. 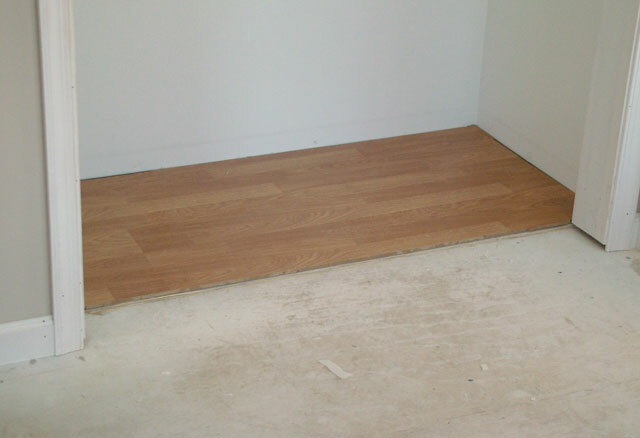 The closets get underlayment panels before laminate flooring. 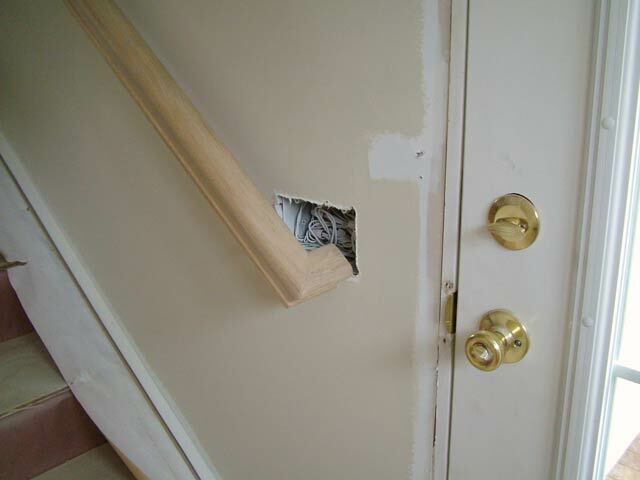 It's not much, but it's one of the few carpentry jobs that I get to do. May 31. The entry to the den is getting a finished arch, but we decided early on not to use a door here. May 31. 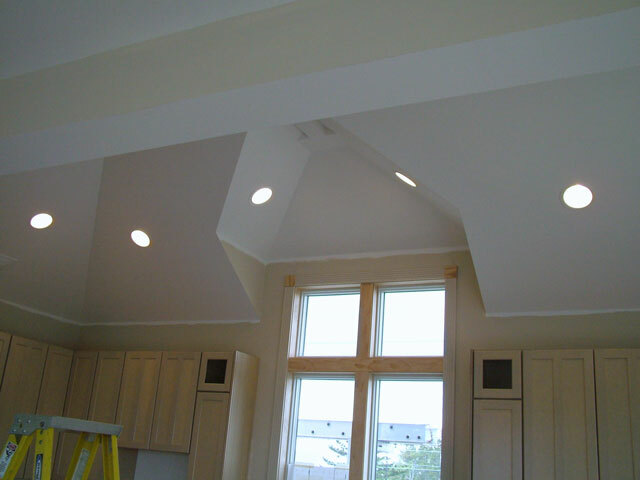 The landing windows have been trimmed. May 31. 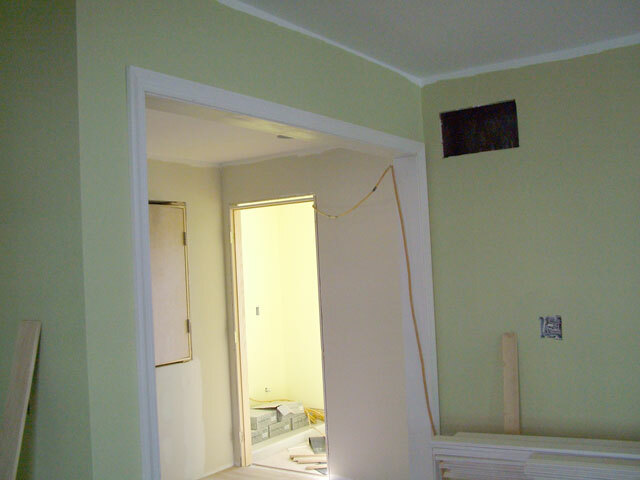 With the floors in, trim molding for doors can now be done. May 31. 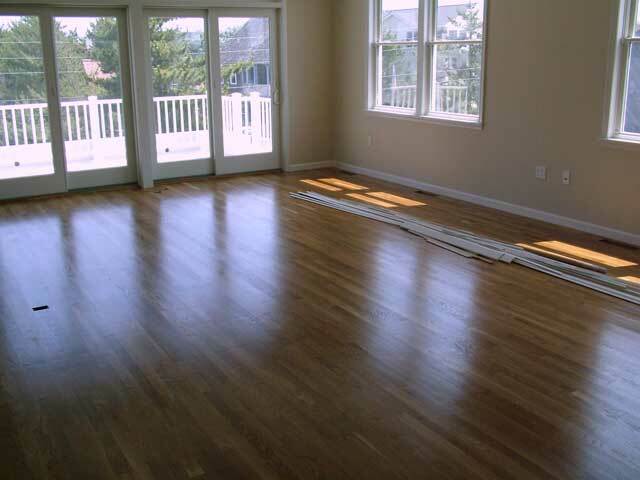 Installation of the hardwood floors was completed today. May 31. 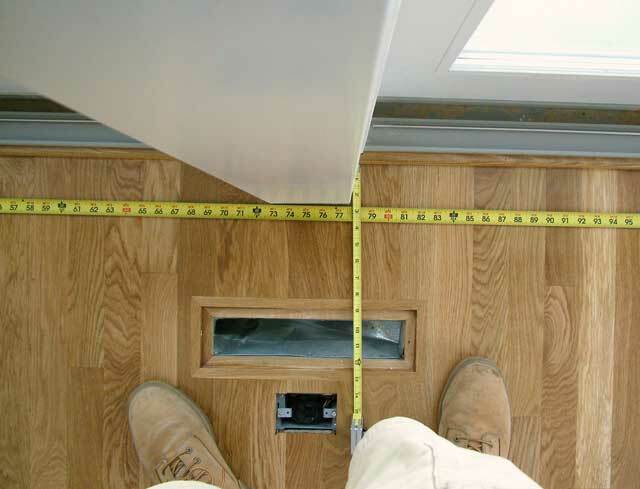 These are cutouts in the hardwood for the floor HVAC registers in the living room. May 26. 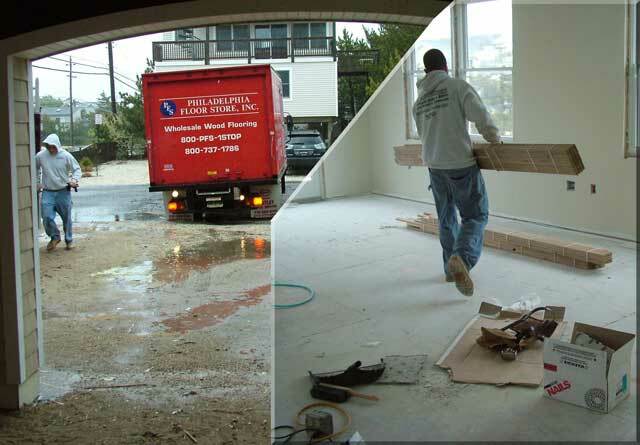 The hardwood flooring installers arrive and go to work. May 25. 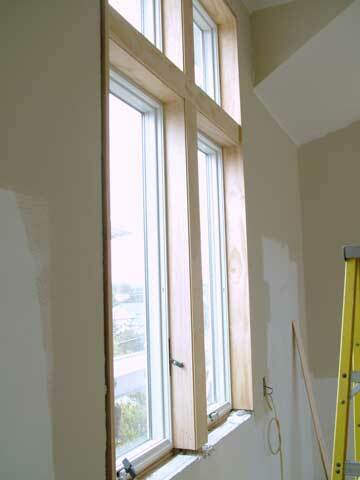 Here's a close-up of the window trim in the northeast bedroom. The extension jams will be painted later and everything then gets a second coat. May 25. 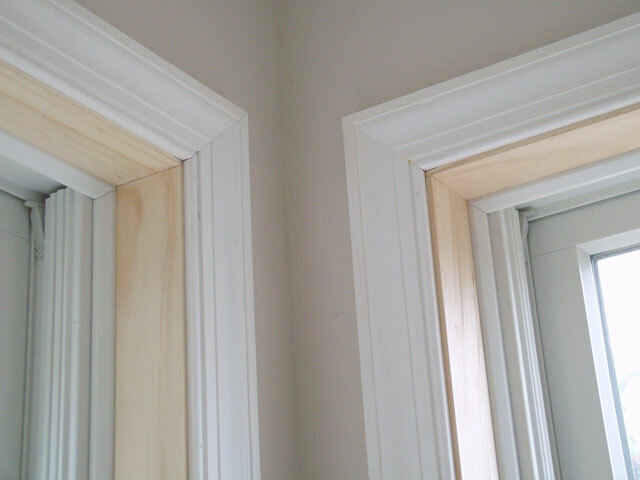 Jeff & his dad are nailing in the interior trim molding today. 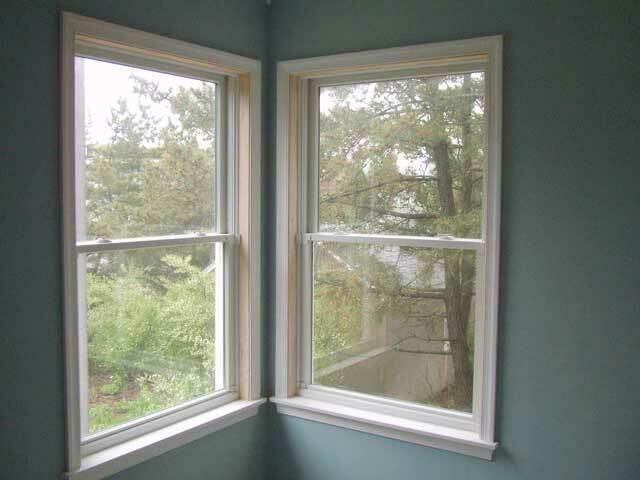 Here are the windows in the southeast bedroom. May 24. 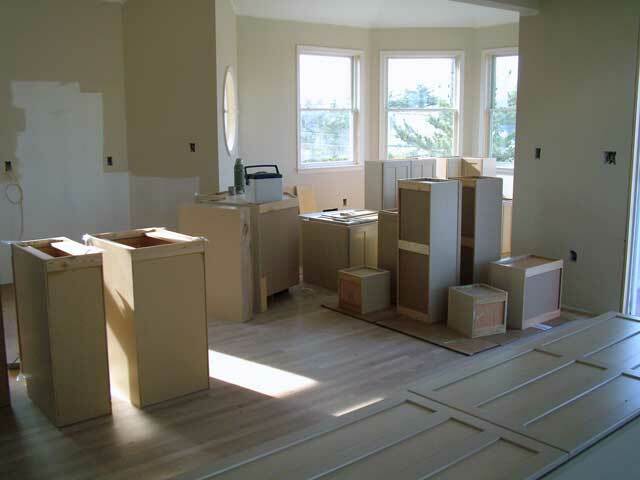 The kitchen cabinets were delivered and stored in a bedroom. 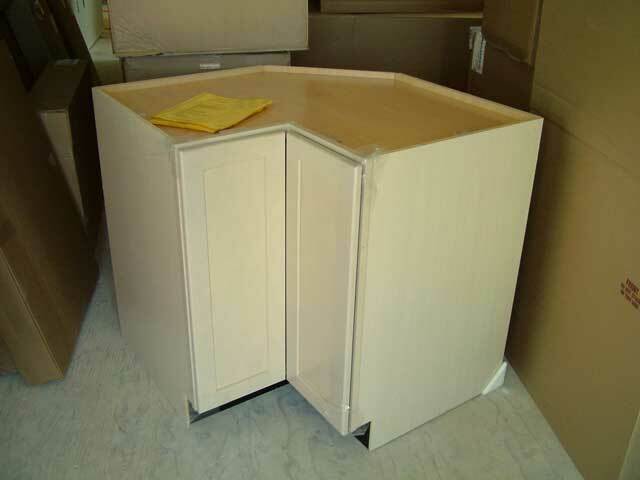 One cabinet, this base corner unit, had to be uncrated to fit through the door. May 23. Today I trucked in all the tiles, weighing about a full ton, from Toms River and distributed them to the appropriate rooms. 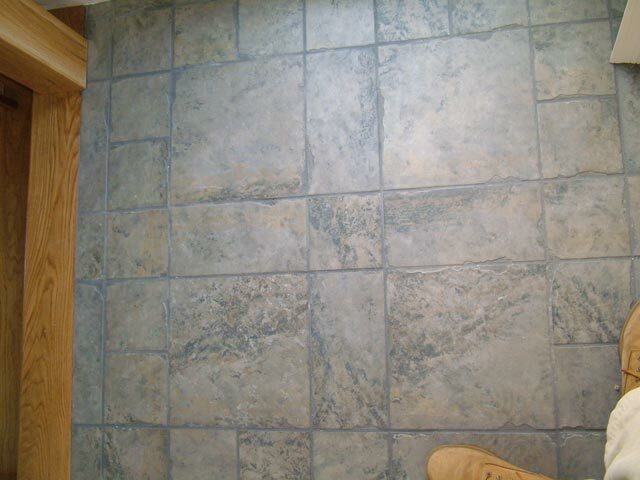 Shown here are master bath floor tiles. May 23. 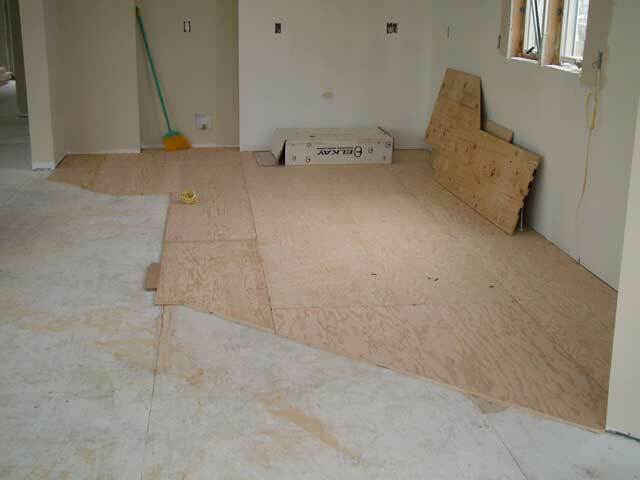 Plywood underlayment has been installed in all floor areas to be tiled. 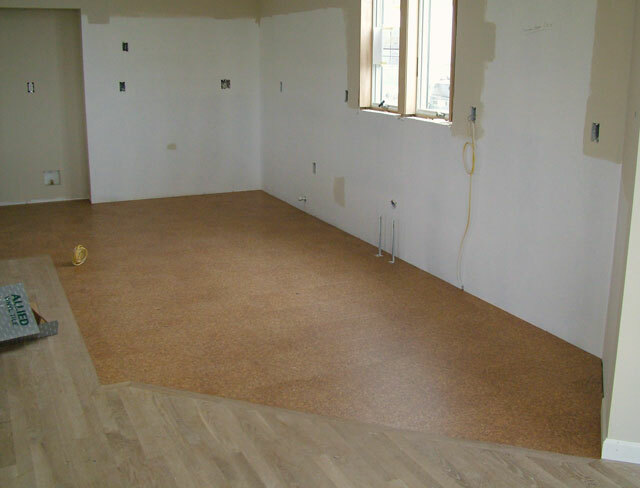 The kitchen faux cork vinyl composite tile (VCT) will go on this section. May 23. 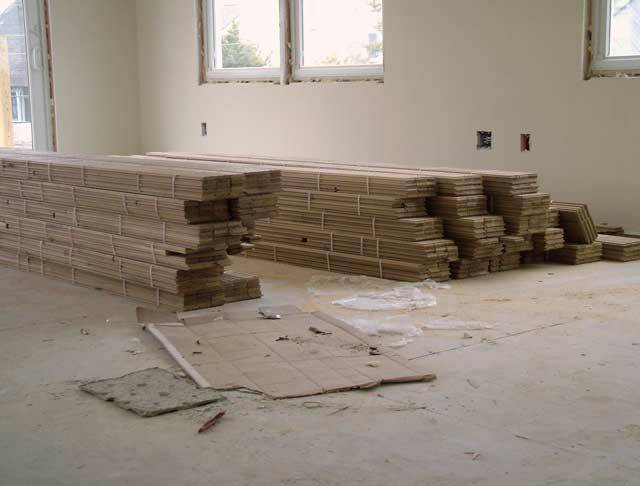 The hardwood flooring is acclimated and ready to be nailed down. May 20. 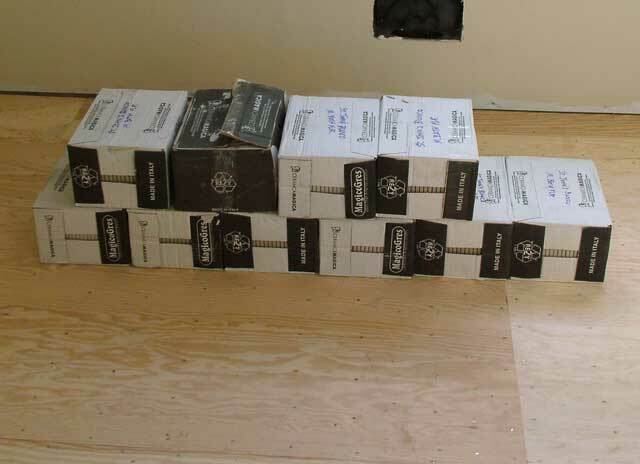 Our hardwood flooring was delivered today. 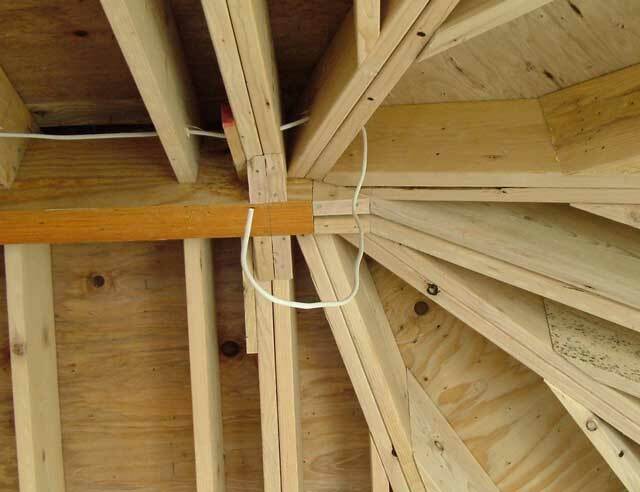 It needs to be stacked inside for several days to acclimate before it can be installed. May 19. 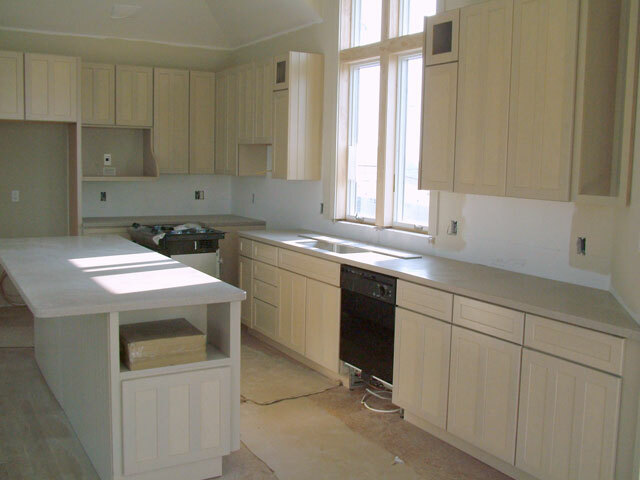 The kitchen area has been painted with a first coat. May 19. 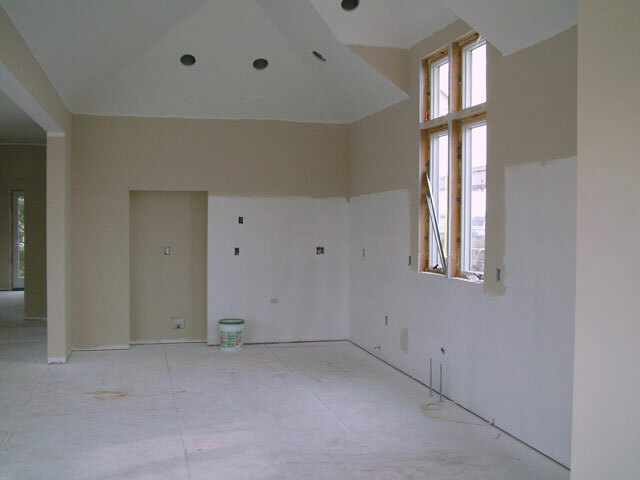 The interior walls have been primed and painted with their first coat. Jayne, with Cindy's help, picked the colors (see paint selections). May 19. 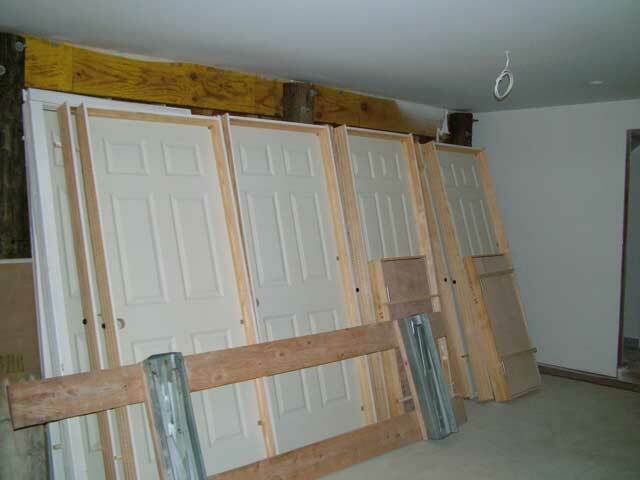 The interior doors have been delivered and are stored in the garage. May 5. 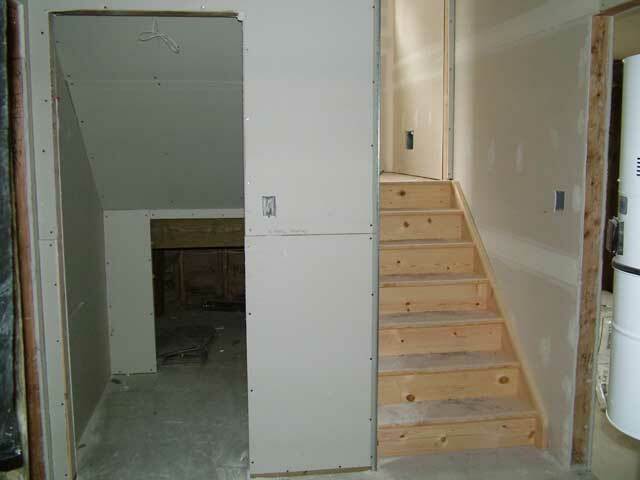 The stairs to the utility area have been framed in. May 5. 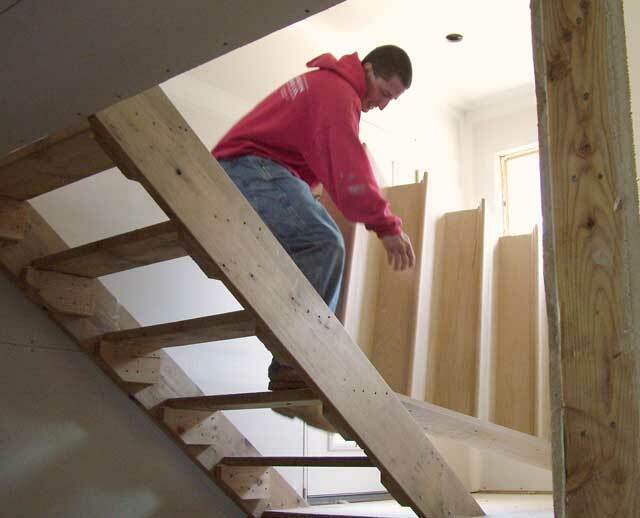 The stairs have been put in place, but are covered with plywood and rosin paper to protect them. Apr. 27. 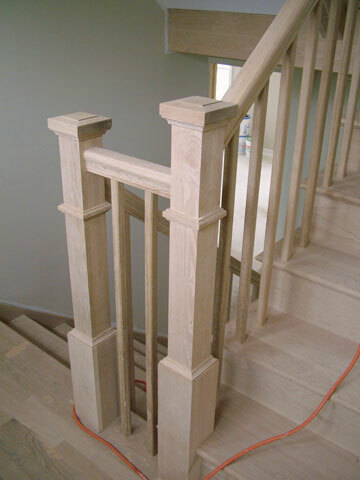 A close-up of the stair detail. 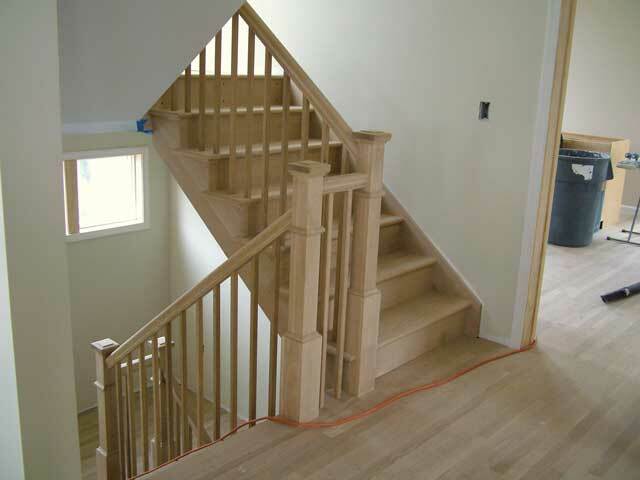 Treads & risers are white oak. Apr. 27. Each stair run weighs several hundred pounds. Maneuvering them up the temporary stairs is strenuous work. Apr. 27. The stairs were delivered today. Apr. 19. The complicated kitchen dormer window has been sheetrocked. See the underlying framing here. Apr. 19. 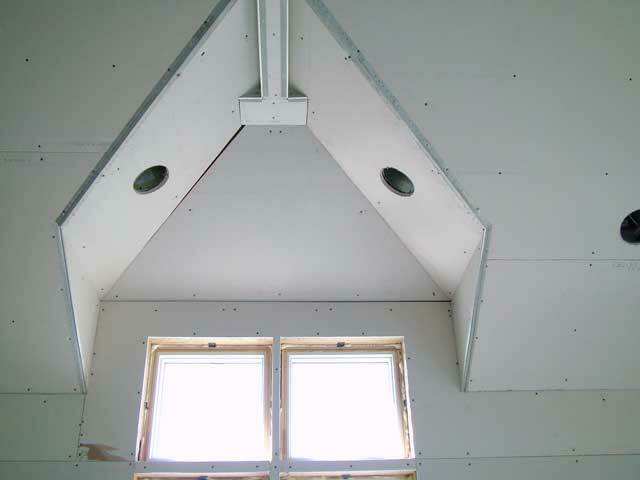 The kitchen sheetrock has its first pass of joint compound. Apr. 14. 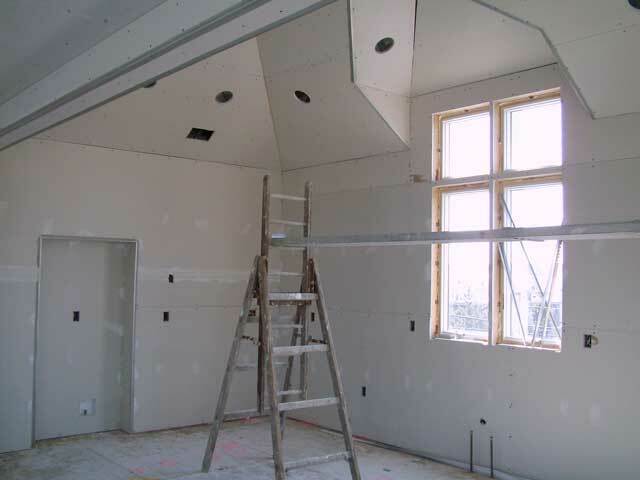 The rooms close in rapidly as sheetrock goes up. Apr. 14. 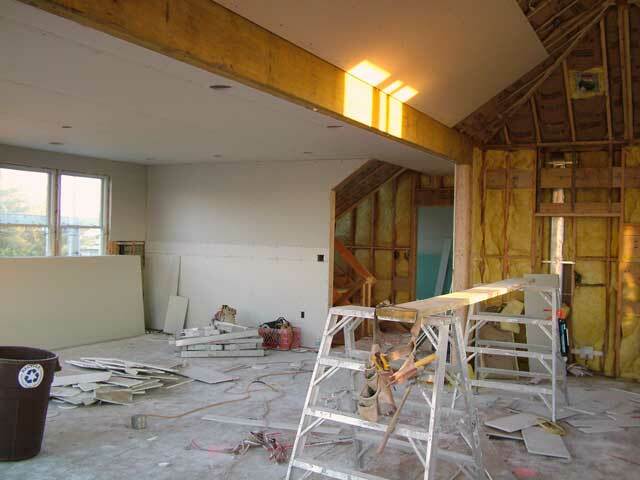 The large sheetrock crew started today and managed to get almost half of the sheetrock up by sundown. The 4x12 sheets were lifted to the 1st & 2nd floor by boom crane. Mar. 15. 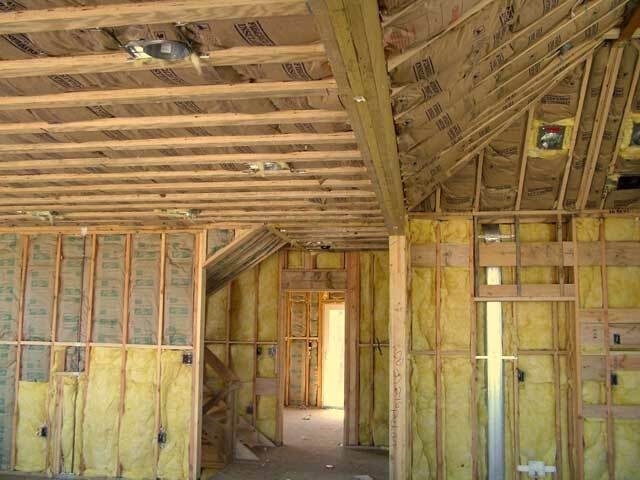 Three insulation installers put fiberglass insulation in the entire house (all three floors) in a little over one day. I'm amazed at how fast this part goes. Mar. 15. Another detail falls into place. 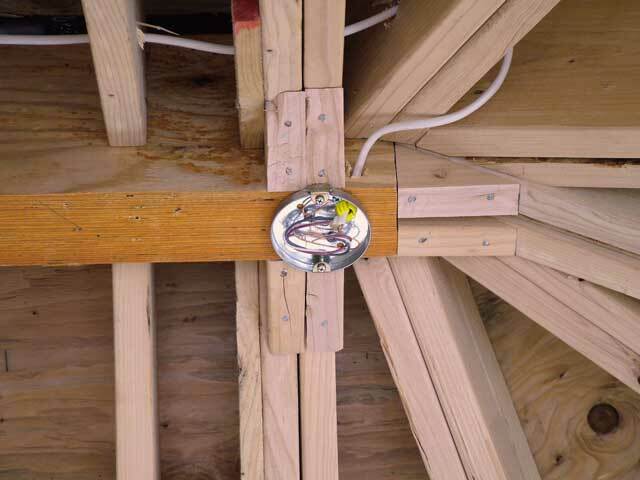 The pendant light for the dining table will hang from this "pancake" style electrical box. Mar. 9. 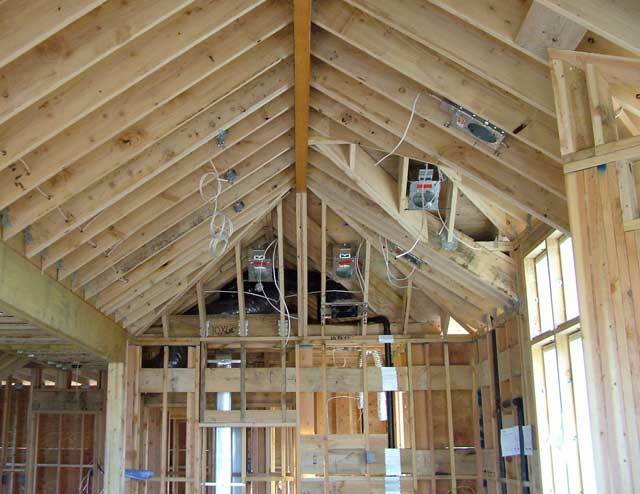 A particular detail that has caused concern is the dining room peak, which will hold a pendant light electrical box. With a few added 2x pieces, I think Jeff has it right. Mar. 9. 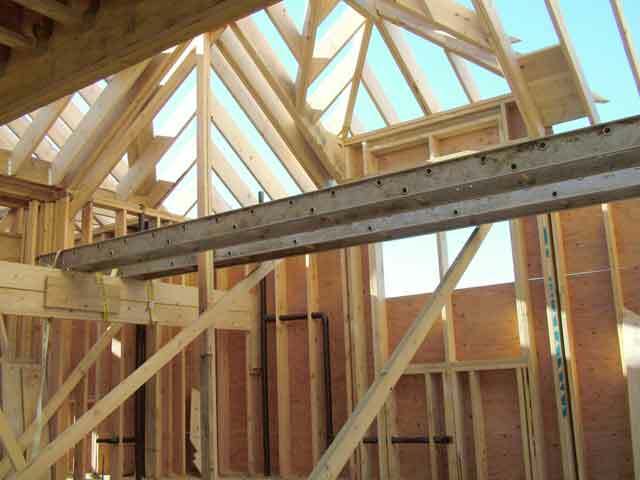 Jeff is filling out frame details in the top beam over the kitchen to make sheetrocking feasible. Mar. 7. 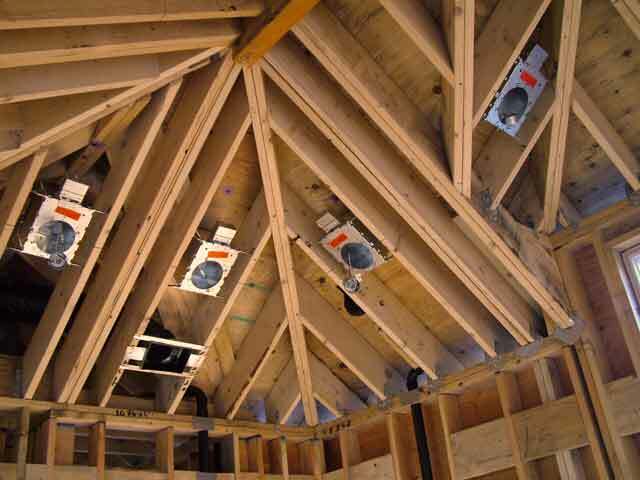 Likewise, the AC wires for the living room overheads are pulled. Mar. 7. 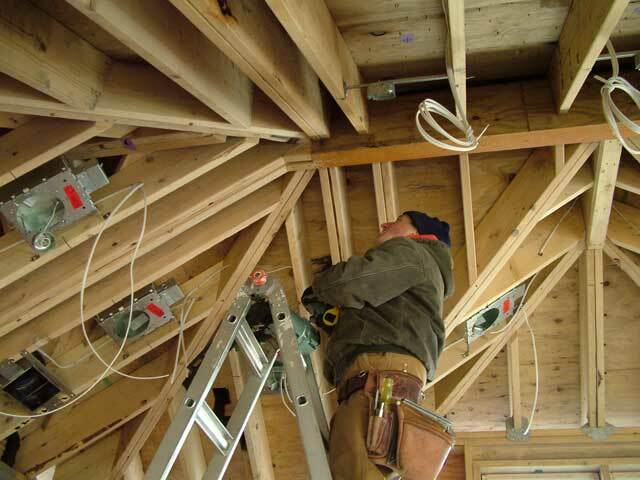 The AC wires are being pulled to supply overhead lights. Mar. 4. 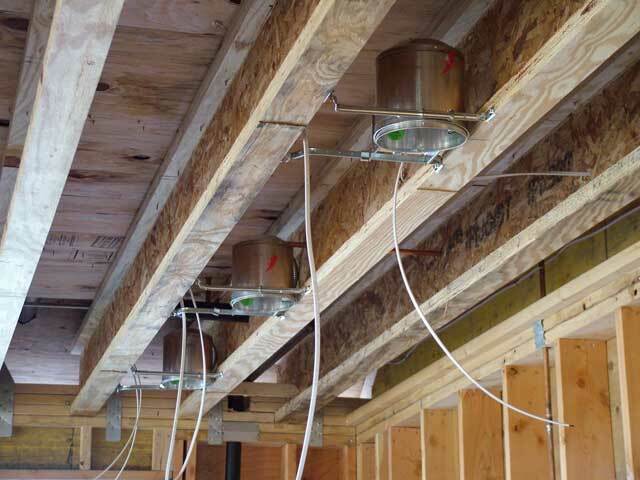 These are some of the living room recessed light fixtures, mounted between the i-joists under the top deck. Mar. 4. 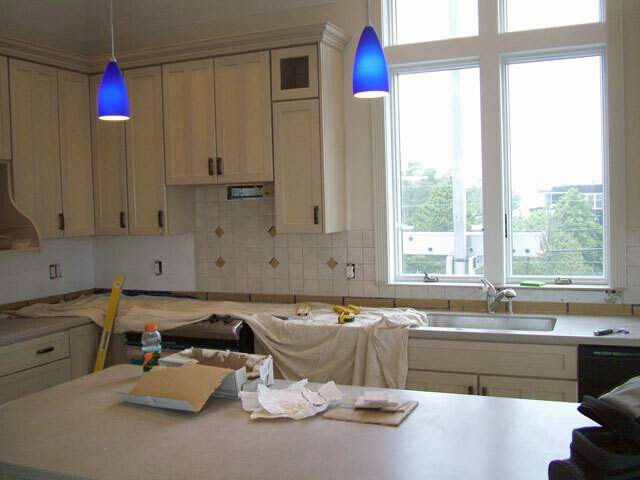 The electricians have put in the sloped recessed light fixtures for the kitchen. I set the locations using a laser plumb tool. Feb. 24. 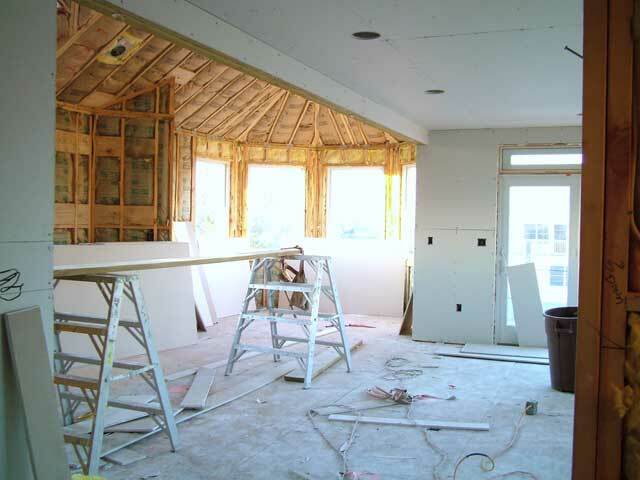 A slightly wider view of the unfinished living area. This is a composite photo. Feb. 21. 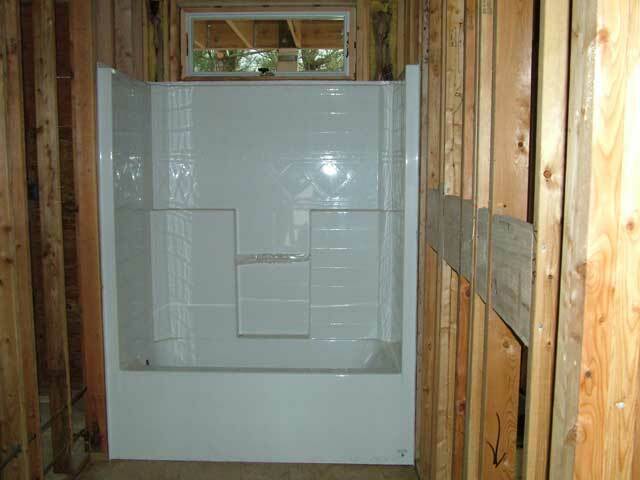 This is the fiberglass tub/shower in the 1st floor south bathroom. Since it's a single piece, it had to be brought in early in the process. Feb. 21, 2005. 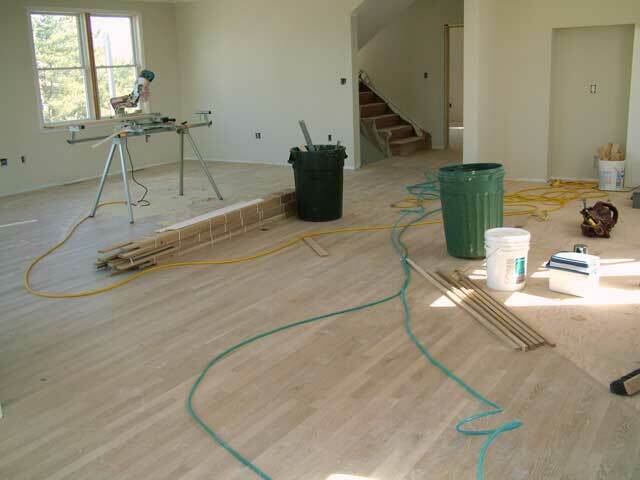 The interior living spaces are ready for finishing. BTW, that's my new ladder.